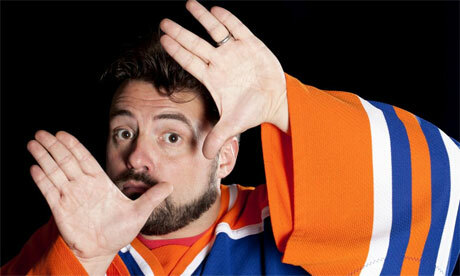 Report: “Clerks” Director Kevin Smith Wins Sundance Deal. | The Cineaste's Lament. ← New “Snow White and the Huntsman” Trailer Released. “Kevin Smith has signed a deal with Canadian distributor Phase 4 that will see 12 films exhibited under the Kevin Smith and SModcast Presents … banner in the US and Canada over the next three years. The SModcast stable will consist of finished works by independent film-makers, handpicked by Smith, who will tour with the films, introduce them to audiences and host Q&A sessions after the show. It’s hard to understate the enthusiasm I felt when “Clerks” was released in the early 1990s. Smith was the first director of my generation, GenX, to come out and make a statement (a hilariously funny one, at that) about what it was like to be a new college grad or in your 20s in the early 1990s. And I’d always hoped he go on to become a major director, kind of our Scorcese. His work since has been patch — the world really didn’t need “Jay and Silent Bob Strike Back,” or (god forbid) “Clerks II,” but Smith did make a heartbreakingly funny film in “Chasing Amy,” and provided a keen analysis of religion with “Dogma.” I haven’t seen “Red State” yet, but it’s on my to-view list. This entry was posted in drama, Film News and tagged Chasing Amy, Clerks, Dogma, indie directors, Kevin Smith, red-state, SModcast, Sundance. Bookmark the permalink.